“I am a changeling–a word that describes within its own name what we are bound and intended to do. We kidnap a human child and replace him or her with one of our own. . . .”The double story of Henry Day begins in 1949, when he is kidnapped at age seven by a band of wild childlike beings who live in an ancient, secret community in the forest. The changelings rename their captive Aniday and he becomes, like them, unaging and stuck in time. They leave one of their own to take his place, an imposter who must try–with varying success–to hide his true identity from the Day family. As the changeling Henry grows up, he is haunted by glimpses of his lost double and by vague memories of his own childhood a century earlier. 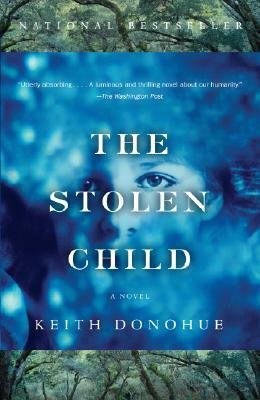 Narrated in turns by Henry and Aniday, The Stolen Child follows them as their lives converge, driven by their obsessive search for who they were before they changed places in the world. Moving from a realistic setting in small-town America deep into the forest of humankind’s most basic desires and fears, this remarkable novel is a haunting fable about identity and the illusory innocence of childhood. Keith Donohue is the Director of Communications for the National Historical Publications and Records Commission, the grant-making arm of the National Archives in Washington, DC. Until 1998 he worked at the National Endowment for the Arts and wrote hundreds of speeches for chairmen John Frohnmayer and Jane Alexander. He has written articles for The New York Times, The Washington Post, The Atlanta Journal-Constitution and other newspapers. Donohue holds a Ph.D. in English from The Catholic University of America. His dissertation on Irish writer Flann O'Brien was published as The Irish Anatomist: A Study of Flann O'Brien (Maunsel Press, 2003).